It’s never too early to prepare for the changing seasons when you have a bulk apparel order to make. 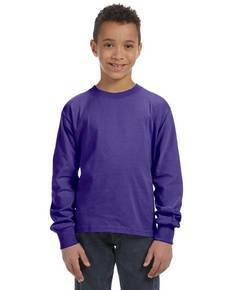 ShirtSpace offers a wide selection of long sleeve t-shirts for the guys when the cooler weather rolls in. Whether you’re enjoying crisp afternoons watching college football or need great athletic long sleeve t-shirts that men can wear while being active in the cold, we’ve got the cut, fit, style, color, and price that aligns with your clothing needs. 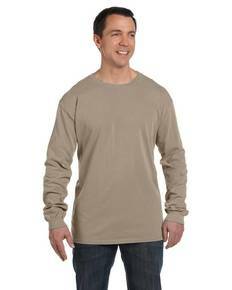 Our long sleeve t-shirts for guys on the go include those made with athletic material as well as antimicrobial fabric. Or if you’re going at a slightly slower pace, check out our different fabric blends to find exactly what you need in your long sleeve shirt. Prints and patterns offer even more variety. Don’t miss baseball tee styles if you’re looking to put together a recreational softball team this fall. 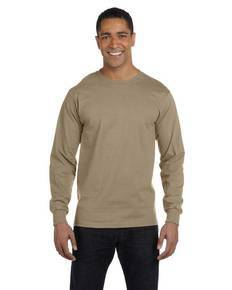 Or grab one of the many camo long sleeve t-shirts men can wear outdoors or while hunting. The options are nearly endless when it comes to making your apparel selection—and so are the ways you can save and get the exact order you want. That’s because we don’t have any order minimums. If you only need a handful, you’ll receive the same great customer service and low pricing as someone ordering a hundred t-shirts. If you do want to order in wholesale quantities, don’t forget to ask about bulk order pricing, as well. But don’t worry, long sleeve t-shirt enthusiasts who are looking for as few as five shirts rather than five hundred. ShirtSpace does not have any order minumums and offers unbeatable prices to all customers!